Commercially available test equipment for hobbyists in the 21st century is pretty high quality at a relatively low price, so the motivation for buying parts and building your own RF power meter has to be driven not by cost, but by a desire to gain the experience. This article presents a simple RF power meter that can be built for about $25 worth of parts. 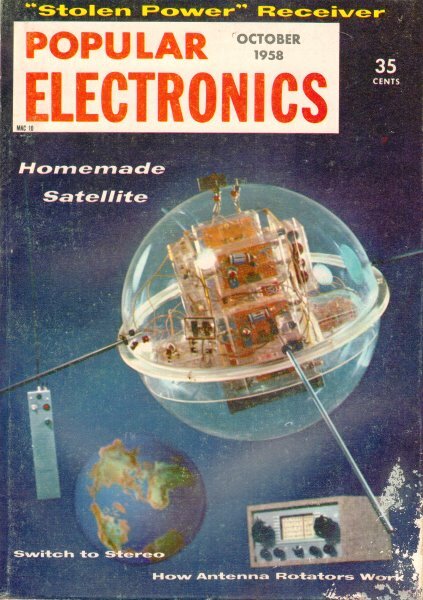 All the parts should be readily available except for the Raytheon CK-721 (or CK-722) germanium PNP transistor. The 2N3906 and the 2N2907 have been suggested as replacements, but some changes in the biasing resistors might be required. This inexpensive r.f. 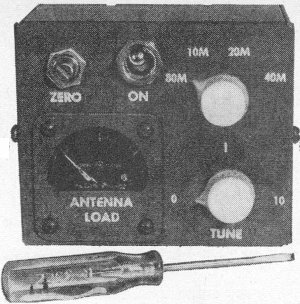 indicator has a wide variety of uses around the ham shack or mobile radio installation. It can act as an absorption frequency meter (if calibrated), a field strength meter, neutralization indicator, or modulation monitor with phones. However, the main job of the model shown is to indicate proper antenna loading for my "minified" mobile transmitter. It is relatively simple to put together, and nearly any low-priced transistor will work well. However, for maximum sensitivity, a transistor with a beta (current amplification) of .between 25 and 45 should be used. Construction. A 3 3/4" x 3" x 2 1/8" aluminum chassis houses all parts. The coil (L1) is tapped and connected. to switch S1 before installation in the box to facilitate soldering. Then the coil is cemented to the box by its plastic support. Care should be taken in soldering the crystal diode (CR1) into the circuit by "heat sinking" the connections with a pair of long-nose pliers. A socket should be used for the transistor. Fasten the 1 1/2-volt cell to the chassis with household cement. With normal use, it should last almost its shelf-life. After the unit is turned on, zero the meter with potentiometer R3 in the collector circuit. 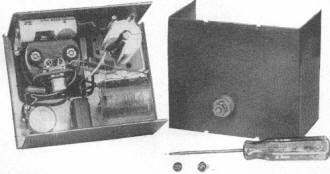 Attach a small wire to the input binding post on the rear of the box which feeds r.f. to the tuned circuit, and you are in business. Applications. If the device is to be used as an absorption frequency meter, it can be calibrated with a heterodyne frequency meter coupled to the input post through a small (about 500-μμfd.) capacitor. The simplicity of the r.f. meter circuit (see schematic below) makes for ease of layout on the chassis (above). Number of turns tapped on L1 for each band is indicated on the schematic. Finished meter is shown at top. A 2-1/2" length of wire is sufficient for r.f. 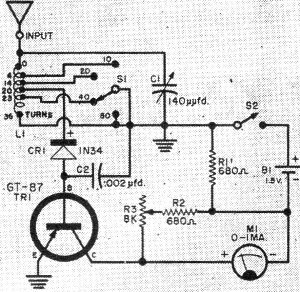 pickup when checking oscillator, doubler or buffer and final amplifier stages of a trans­mitter. When using the indicator as a field strength meter to adjust a beam antenna, the pickup wire length will depend upon the distance from the antenna and how much power is being applied from the transmitter's final amplifier. Usually, a 2" piece of wire will afford sufficient pickup at 100 feet with the average low-power transmitter when the device is hand-held. To provide some attenuation of very strong signals, the indicator can be used harmonically. Set the bandswitch to 40 meters when you want to measure carrier strength on 80 meters. As a means for tuning mobile or fixed transmitters (especially those employing pi-output-networks), this unit enables one to determine very quickly if the antenna and not the pi-network is taking the load. For mobile operation, the regular auto broadcast antenna can be used for signal pickup. However, the device should be harmonically operated as described above because of the strong signal present. If the auto antenna is not used, try a small piece of insulated wire taped to the inside of the front bumper, connected with shielded wire to the indicator. If you are interested in monitoring your modulation, a pair of magnetic phones can be connected in the collector circuit of the transistor. The meter is disconnected (as well as the top of the balancing potentiometer) and the phones are connected between battery minus and collector. Radio frequency energy tuned by L1-C1 is applied to diode CR1. The rectified current then takes a path through the base-emitter circuit of transistor TR1. Current amplification occurs and is read by the 0.1 milliammeter. Capacitor C2, connected between the transistor base and ground. bypasses the radio frequency. The greater the strength of the r.f. signal picked up, the higher the reading on the meter.